Mark your items with SelectaLabel Asset Labels and make them less attractive to thieves. 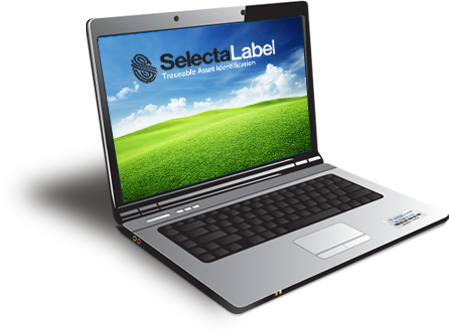 Use our online Label Maker to design your perfect label now. With years of experience we can also help with your bespoke label requirements. What products can I use it on? How can I manage my assets? Application of asset labels will vary slightly between different label types. Generally speaking, you will first need to find the best place on your item to locate the label – easy to view or access with a barcode scanner. It is very important to ensure that the surface of the chosen area is clean and free from grease, dirt and cleaning agents. Then, simply peel off the backing and apply - taking particular care if the label is tamper resistant. The glue on the label will be fully cured after around 48 hours. Browse our list of Labels today and see benefits and features of each. Once you have decided which will best suit your needs, use our Label Maker to create your design. When it comes to choosing which items to protect with the use of asset tags, it is prudent to take a common sense approach and carefully consider which equipment is most likely to be stolen and which has the most the most tangible value. There are a great many objects which can be stolen from a business premises but by carefully deploying asset tags throughout your premises, you will be able to significantly reduce the likelihood that your property will be affected by thieves. Asset tags are a very well crafted response to the threat of theft of burglary in business or residential premises as they not only act as a deterrent to those thinking of stealing your property but can also help in the recovery of property that has been stolen as they make a mark on stolen goods if anyone endeavour to remove the asset tags from the piece of property. By know what to and what not to tag, you will heighten the effectiveness of your asset tags. Not only items found in a work type environment are suitable for use with asset tags. For example, it is, of course, nonsensical to place asset tags on consumable products, or utterly immovable objects. It is also unwise to place asset tags on items like antiques because it may adversely affect the value of the piece even if it does prevent it from being stolen. Asset tags are, of course, first and foremost a theft deterrent but they also have another important use when it comes to the application of asset tags in a warehouse style environment. Asset tags have also prove eminently efficient as a means of taking stock of your products and keeping track of their location at all times. This is obviously an important feature of asset tags which merely adds to its gravitas as an anti-theft device. Any one who steals an item that is fitted with asset tags will find it to be a fruitless endeavour because asset tags not only make it nigh on impossible to shift stolen goods, they also assist in the location and recovery of stolen property. The way in which asset tags work is very well implemented to ensure that their mere presence is often sufficient to act as a deterrent to theft but, on top of this, it is the stock monitoring capabilities of asset tags that prove the biggest draw for many companies. Asset tags are an extremely viable and accurate means of keeping tabs on all of your stock items to ensure that none of it goes missing and that you’ll be able to locate it if it does. It is important to choose the right sort of asset tags for your inventory to ensure that it operates optimally. For example, if your stock is kept outside for the most part, you will need to choose a form of asset tags which are more suited to these sorts of conditions than would be the case if your stock was stored in an indoor environment.